Last Week in Review: July’s Jobs Report showed continued signs of improvement. Forecast for the Week: Thursday’s Retail Sales report will be the closely watched release on a light economic calendar. View: Wrap up your summer with a reading list to boost morale and motivate you to take on the rest of the year. “Working 9 to 5. What a way to make a living.” Dolly Parton. A heavy economic calendar culminated the week with July’s Jobs Report singing of work for many Americans. The housing market showed strong gains as well. Employers added 215,000 new jobs in July, while the figures for May and June were revised higher by a total of 13,000 jobs. Retail, health care and leisure led the pack with job opportunities. The unemployment rate held on to its seven-year low, which is also good news. While the average workweek increased, growth rate of wages remains at the lowest levels on record. 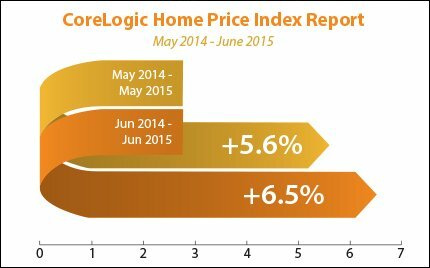 Home prices jumped in June. Research firm CoreLogic reported that home prices rose 6.5 percent, marking the 40th consecutive month of year-over-year gains. While prices are still down from the peak in April 2006, they are expected to continue to rise. CoreLogic cited pent-up demand, affordability and a more robust labor market for the gains. Data continues to show that the job market, housing sector and economy overall are improving, even though inflation remains below the Fed’s 2 percent target. The big question now is whether or not our economy has improved enough for the Federal Reserve to begin raising its benchmark Fed Funds Rate (the rate banks use to lend each other money overnight). September’s Federal Open Market Committee meeting provides the next opportunity to see what the Fed will do. For now, home loan rates remain near historic lows. Let me know if I can answer any questions at all about the mortgage market, housing or home loan rates for you or your clients. This week’s economic calendar is light, though the second half of the week features several key reports. Tuesday kicks off with data from second quarter Productivity. Jump ahead to Thursday with weekly Initial Jobless Claims and the closely watched Retail Sales report. On Friday, the Consumer Sentiment and the Producer Price Indexes will be released. When you see these Bond prices moving higher, it means home loan rates are improving; and when they are moving lower, home loan rates are getting worse. To go one step further a red “candle” means that MBS worsened during the day, while a green “candle” means MBS improved during the day. Depending on how dramatic the changes are on any given day, this can cause rate changes throughout the day, as well as on the rate sheets we start with each morning. 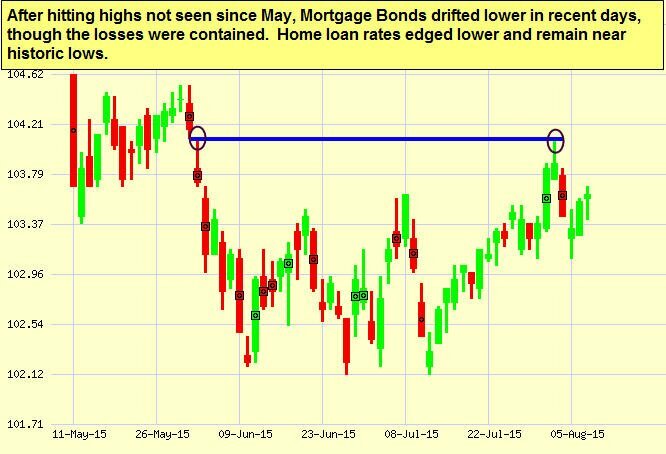 As you can see in the chart below, Mortgage Bonds improved throughout the latter part of July. Home loan rates remain near historic lows. If you’re looking for a few great titles to wrap up your summer reading, look no further than these top picks from Amazon’s Best Seller list! These great reads will boost your morale and motivate you to take on the rest of the year. Getting to Yes with Yourself (and Other Worthy Opponents) is the highly anticipated follow up to “Getting to Yes: Negotiation Agreement Without Giving In.” Harvard University professor and negotiation expert William Ury addresses one of the most common obstacles to achieving goals: negative self-talk. StrengthsFinder 2.0 asks if you have the opportunity to do what you do best every day. For many, natural talents go untapped. Instead, people devote more time to fixing perceived shortcomings than to developing and using strengths. This book reveals how to change the pattern. The Life-Changing Magic of Tidying Up: The Japanese Art of Decluttering and Organizing shares the secrets of the most popular organization consultant in Tokyo. Disorganization contributes to problems in both business and life. But author Marie Kondo (whose consultancy has a three-month waiting list) promises if you organize your home or office just once—and do it properly—you’ll never have to do it again, and you’ll see positive results. The Achievement Habit: Stop Wishing, Start Doing, and Take Command of Your Life written by the co-founder of Stanford’s d.School, Bernard Roth, shares thinking insights gained from solving large-scale design projects. Gain confidence, overcome obstacles that keep you from your potential, and learn to think more creatively from one of the masters of applied creative thought. As always, feel free to pass these helpful tips along to your team, your clients and colleagues! Last Week in Review: February’s Jobs Report was better than expected, while home price gains are at sustainable levels. Forecast for the Week: Look for news on wholesale inflation, consumer sentiment and retail sales. Last Week in Review: Retail sales plummeted, inflation remains tame, and home loan rates are hovering near record lows.Forecast for the Week: It’s a holiday-shortened week, with housing reports dominating the headlines.View: These five podcasts are great tools to help you succeed this year. Shop or drop. Fewer people than expected opened their wallets in December, as the latest Retail Sales numbers declined. But with home loan rates hovering near historic lows, not all of last week’s headlines were disappointing. Retail Sales plunged by 0.9 percent in December, the biggest decline in nearly a year as lower gas prices didn’t have the desired impact on consumer spending during the busy shopping season. November’s numbers were also revised lower. This news was a bit of a surprise, and not the best sign for our overall economic recovery. But one number doesn’t make a trend, so this will be an important report to watch in the coming months.On the inflation front, inflation at the wholesale level remained tamed in December while the Consumer Price Index showed its smallest gain in five years, mainly due to plunging oil prices. We are beginning to see disinflationary pressures, which is a slower rate of inflation over a shorter time period. While low inflation is Bond-friendly news (and also good for home loan rates, since they are tied to Mortgage Bonds), outright deflation is a sustained fall in prices. That is something we do not want to see because deflation also brings increased unemployment. Inflation is another key item to monitor as we move ahead into 2015. Also of note, the World Bank cut its forecast for global growth, warning that the world economy remains overly reliant on the “single engine” of the U.S. recovery. If negative news from overseas continues, we could see safe haven trading into our Bond market, helping Mortgage Bonds and home loan rates in the process. When it comes to recent Jobs Reports, what has been tough is being good every month, as both January’s and December’s numbers were disappointments. January’s Jobs Report can best be described as lackluster, as employers added just 113,000 new workers. This was well below expectations of 175,000 new jobs. 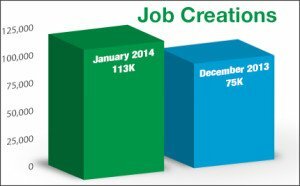 In addition, the number of job creations for December was raised just a paltry 1,000, bringing December’s total to 75,000. November was revised higher to 274,000. The Unemployment Rate did fall to 6.6 percent, from 6.7 percent. However, this is not necessarily a good metric of labor market health, as the more important Labor Force Participation Rate (LFPR) remains at 63 percent, a 35-year low. The LFPR measures the proportion of working-age Americans who have a job or are looking for one, and it should be moving higher in a recovery. 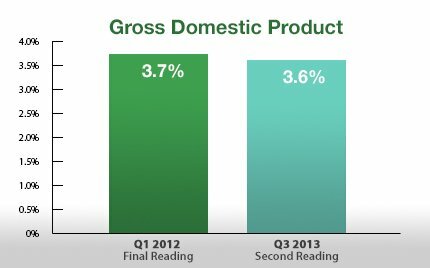 Also of note, productivity in the fourth quarter of 2013 rose by 3.2 percent, with both the third and fourth quarters the highest since the second half of 2009. Employers are squeezing more out of current workers and may not be on the hunt for new employees given the economic landscape, which is another negative for the labor market. 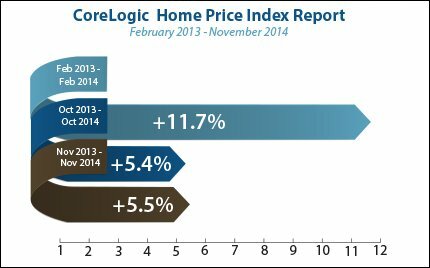 In housing news, research firm CoreLogic reported that home prices, including distressed sales, rose by 11 percent in December 2013 compared to December 2012. December marked the 22nd consecutive year-over-year gain in home prices nationally. However, from November to December, prices fell by 0.1 percent. What does this mean for home loan rates? Mortgage Bonds and home loan rates have seen some improvement of late, due to some weak economic reports, while Stocks have suffered as a result. But a big question remains as we move ahead in 2014: If economic reports continue to be weak, will the Fed continue to taper its Bond purchases? Remember that the Fed is now purchasing $35 billion in Treasuries and $30 billion in Mortgage Bonds (the type of Bonds on which home loan rates are based) to help stimulate the economy and housing market. This figure is down from the $85 billion in Bonds and Treasuries the Fed had been purchasing last year. The timing of further tapering is sure to impact Stocks, Bonds and home loan rates throughout the year, and it is a key story to monitor. The economic report calendar is light this week, with reports not beginning until Thursday. Weekly Initial Jobless Claims will be released as usual on Thursday. Claims have been stuck in a tight range the past four weeks. 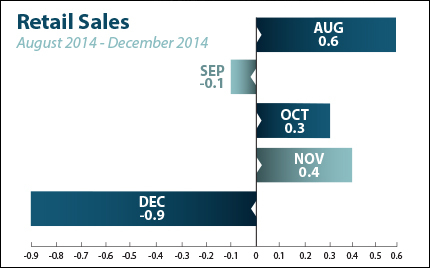 Also on Thursday, look for January’s Retail Sales data. The last report this week will be the preliminary reading on February Consumer Sentiment. When you see these Bond prices moving higher, it means home loan rates are improving and when they are moving lower, home loan rates are getting worse. To go one step further, a red “candle” means that MBS worsened during the day, while a green “candle” means MBS improved during the day. Depending on how dramatic the changes were on any given day, this can cause rate changes throughout the day, as well as on the rate sheets we start with each morning. 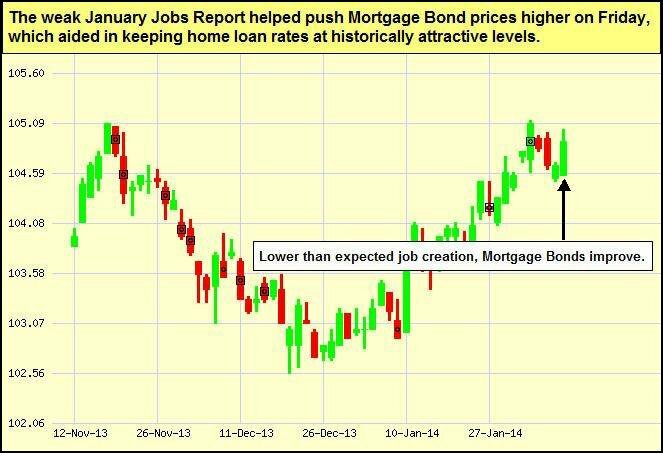 As you can see in the chart below, Mortgage Bonds and home loan rates improved after the weak Jobs Report for January was released. I’ll be watching the news closely this week to see if these improvements continue. Mileage Rates for 2014 If you drive a car, truck or van for work, you’ll want to make sure you know standard mileage rates the Internal Revenue Service (IRS) has set for 2014. These mileage rates are used to calculate deductible costs for driving an automobile for business, charitable, medical and moving purposes. So when it comes to filing your taxes this year, you’ll need these numbers! You’ll notice that the rates for business, medical and moving expenses decreased one-half cent from the 2013 rates. 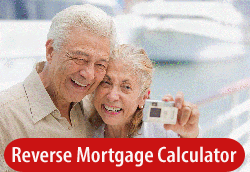 Before you calculate your deduction, make sure you qualify. The IRS reminds taxpayers that they cannot use the business standard mileage rate for a vehicle after using any depreciation method under the Modified Accelerated Cost Recovery System (MACRS) or after claiming a Section 179 deduction for that vehicle. In addition, the business standard mileage rate cannot be used for more than four vehicles used simultaneously. Although the IRS provides the standard mileage rate for ease and convenience, you’re not required to use it. If you prefer, you can calculate the actual costs of using your vehicle instead of using the standard mileage rates. Remember, if you have questions or concerns, talk to a tax consultant or accountant to discuss your options and unique situation. Please feel free to pass these tips along to your team, clients, and colleagues. 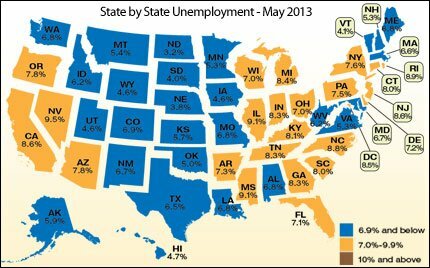 Last Week in Review: Key housing and jobs data was released. Plus a surprising read on Gross Domestic Product, the broadest measure of economic activity. Forecast for the Week: This week’s economic calendar is light, featuring readings on retail sales, jobless claims and wholesale inflation. View: See the important time tip that can make all the difference any time of year. “Tomorrow is often the busiest day of the week.” Spanish Proverb. And it sure seemed that way with last week’s busy economic calendar, as Friday’s Jobs Report capped off a week filled with data. Here are the highlights. The highly anticipated November Jobs Report revealed that employers created 203,000 jobs last month, above the 188,000 expected. The Unemployment Rate fell to a 5-year low of 7 percent while the Labor Force Participation Rate (LFPR) managed to tick up to 63.0 percent, though it is still at lows not seen since the late 1970s. The LFPR is a measure of how many people are looking for work. All in all this was a good report, but the labor market is not out of the woods yet.